Reexamining Books will be on display Sep. 6 - Dec. 15, 2012, in the Main Library, the Art Library, and the Lehman Loeb Art Center. 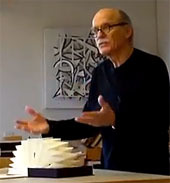 Werner Pfeiffer discusses Book Objects vs. Artist's Books. More videos available on the media page. 2012 marks the 75th birthday of Werner Pfeiffer, an artist who for half a century has worked in a variety of media, including books, collages, drawings, prints, paintings, and sculptures. 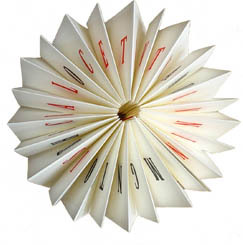 Though Pfeiffer's output is multifaceted, he has become known especially as a creator of artist's books and book objects. These works by their very nature push us to reconsider basic questions about the place of books and reading in contemporary society. Vassar College is pleased to host the exhibition Reexamining Books: Book Objects and Artist's Books by Werner Pfeiffer. The exhibition extends across campus to three locations: the Main Library, the Art Library, and the Frances Lehman Loeb Art Center. Though one would expect the library to feature books and the art center book-objects, instead the opposite is taking place (objects in the library, books in the art center), while the Art Library, physically located between these two places, will show examples of both. We hope this unexpected arrangement will contribute toward a reexamination of books as much as the individual works of art themselves. There are many people to acknowledge for their contributions to the exhibition and related programming. First, our thanks to Werner himself, who was deeply involved in all aspects of the exhibition design. Sabrina Pape, director of libraries, supported this project from its inception. Molly Nesbit, chair of the Art Department, lent her support as well. We appreciate the opportunity to collaborate with Patricia Phagan and Mary-Kay Lombino, our colleagues in the Art Center. George Laws and Janet Allison went the extra mile to produce the print publication. Carolyn Guyer, Tamar Thibodeau and Morgan Gange in Communications helped with publicity and our website. Alex Levy and Baynard Bailey together produced a wonderful video for the exhibition.